Everybody in Addis talks about the Gheralta Lodge in Tigray as being the best one in Ethiopia. The place is so popular that it is advisable to book weeks if not months in advance. I finally managed to secure a booking last week for a long weekend, and I can confirm that it is one of the bext places to stay in the country, providing the right mix of comfort, scenery, ecological approach and delicious food. 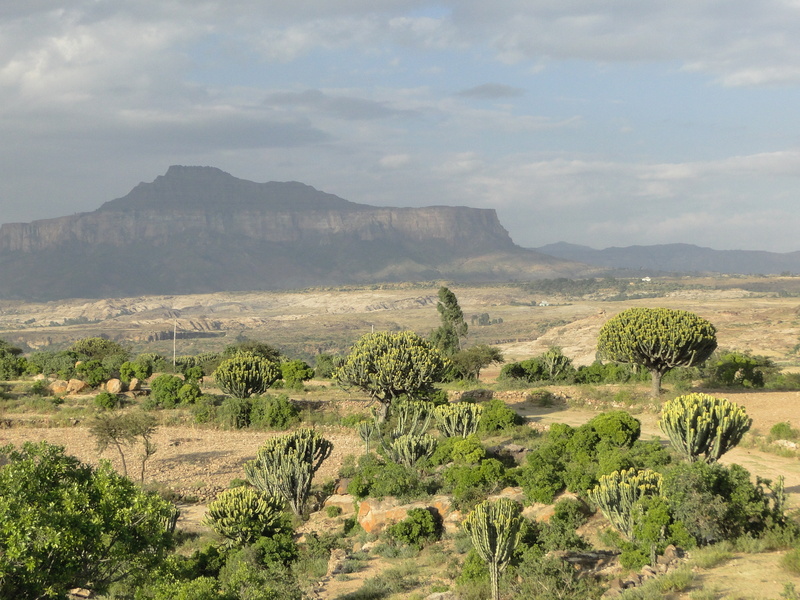 The Gheralta is an area of Tigray best known for its rocky mountains which hide ancient rock-hewn churches. Located half way between the cities of Axum and Mekele, it takes around three hours to reach the place. We flew to Axum and drove directly from there, after a short stop in town to visit the ancient stelae (I’ll write more about it in the next post). We passed through the town of Adwa (on the main road to Adigrat), famous for having been the seat of the epic battle in which king Menelik II won over the Italian troups in 1896 and thus preserved Ethiopia’s independence. Adwa is a medium size town with no particular interest for visitors, except that it was also the birth place of the late Prime Minister, Meles Zenawi, which we can guess from the many life size posters of him in town. For these reasons, Adwa still resonates and continues to fuel the nationalistic pride of the Ethiopian people. From Adwa, we took the turn onto the 90 kilometres narrow and windy gravel road leading to Gheralta. That was the longer part of the journey, but the scenery was quite spectacular, with extensive views of the valley around. The whole area is quite mountainous so we were high up in parts, driving along the escarpment and overlooking deep gorges. We arrived in Gheralta at around 2.30 pm, just in time for a late lunch. The lodge is just as renowned for its food and use of home-grown organic products. Every lunch and dinner we had a typical Italian three-course menu with in addition, a salad bar offering of wide selection of different lettuces, rocket salad, bitter leaves, tomatoes, fresh beetroot, avocados, and so on. For once, we didn’t have to worry about eating salad and raw food, as we knew it was cared for. The Gheralta Lodge was set up a few years ago by Silvio, an Italian man who grew up in Addis, left Ethiopia when he was 18 and returned some 40 years later to open a lodge. That was his idea of retiring. He chose one of the remotest yet beautiful places in the country, where good accomodation was lacking. From the start, his venture was a success mainly because he was able to create a place where people felt comfortable and wanted to return to, which is not always the case in Ethiopia. The rooms, located in individual stone houses, were decorated with great care, making use of local material but bringing an individual touch as well. The common lounge and retaurant areas have a balanced mix of traditional Ethiopian furniture as well as contemporary features. At times, I wasn’t sure whether I was in a unique region of Ethiopia or somewhere in Italy. The island of Pantelleria came to mind because of the architecture of the ochre stone houses, but the landscape itself reminded me of some parts of Tuscany. I could see why an Italian man would have chosen this place. The next day, we went on a long trek up the mountain to visit one of the rock-hewn churches, Yohannis Makudi, which we chose because of the suitability of the walk for the smallest of our children. Most of the Gheralta churches are not easily accessible and require some serious walking if not climbing on rocks. The walk up to Makudi took about an hour zigzagging on a narrow and stoney path on the flank of the mountain, which wasn’t particularly difficult but long and strenous because of the heat (we were stupid enough to start walking after 11pm). Local kids who were off school, followed us all the way up. They live in remote rural areas where not much is happening, so a family of farenji walking up the hill was definitely an event worth watching for them. As we reached the peak, we had stunning views of the two valleys below, one on each side of the rocky mountain. We then walked through a stone arch, the gate to the church’s garden, where we were allowed to picnic under the shade of an old African olive tree. The entrance to the church itself was hidden so well behind a rock and large tree, that we couldn’t even see it from the garden. The inside was just as spectacular as the setting. 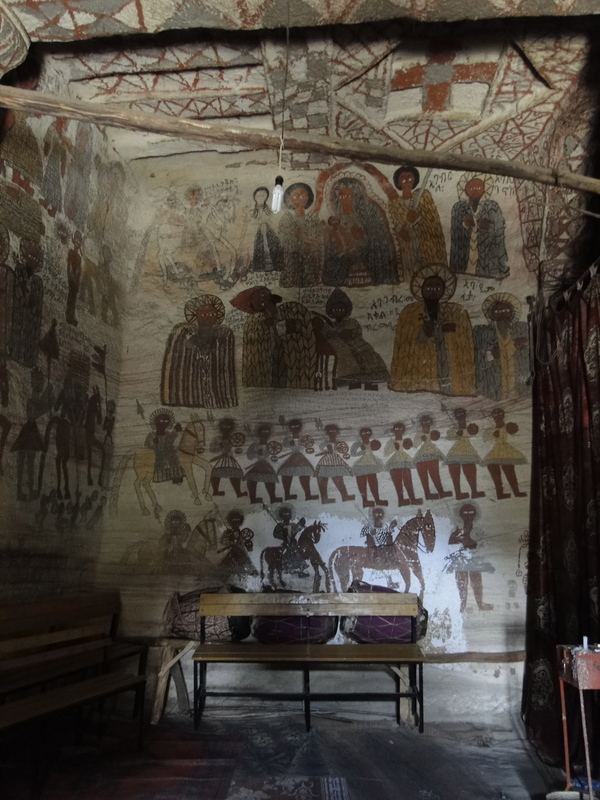 Carved directly into the rock, Makudi is small and intimate but decorated with unsual frescoes depicting the usual Ethiopian Saints surrounding by the Virgin Mary. However, their representation was different and somewhat unique there. I was told that it is one of the very few churches in Gheralta to have kept its original 18th century decoration. The priest who welcomed us was not as greedy as some of his fellow monks in other churches, which made the whole experience even more pleasant. Rock hewn churches in Gheralta were built on top of mountains, not only because priests were looking for remote places for meditation, but also because the stone was easier to carve and chisel. We took a longer way back down, walking through stoney patches full of seashell fossils before reaching a lush forest with palm trees and monkeys, due to the presence of a water stream down in the valley. During our stay, we visited other minor churches which had none of the spectacular features of Makudi. It was still interesting to walk around the countryside to witness rural life in Tigray at harvest time, when farmers were cutting tef and collecting wheat and sorghum to last until the next harvest. 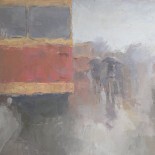 This entry was posted on November 17, 2012 by Salambo in Gheralta, Travelling outside Addis and tagged Axum, Ethiopia, ethiopian church paintings, ethiopian churches, Gheralta, Gheralta Lodge, hawzien, Mekele, Rock-hewn churches of Tigray, sorghum, tef, Tigray, trekking in Gheralta.